Use the selectors below to choose your crate by crate by dog weight, crate size, dog breed, or by crate series (such as iCrate, or Life Stages). 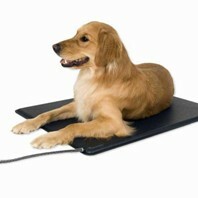 ...or an electric heated pad! These homes fold up “suitcase style” for easy transport and storage. All panels are connected and set up within seconds! They are preferred by those who take their dogs with them when travelling. Fold and carry crates are wire mesh construction. No tools are required to assemble these crates. They are perfect for the dog owner who wants a dog crate that is portable, but also very tough. These are wire homes that have 6 separate panels that are secured together with a “drop-pin” in each of the 4 corners. They are typically used by pet owners who intend to set up their homes and leave them in one place. Drop-pin homes are easy to set up and require no tools for assembly. Soft-sided crates are also called tent crates, or pop-up crates. These crates are very light, come with a free tote bag and transport very easily. They also can accommodate a standard sized crate pan. Suitable for indoor, outdoor and SUV use, these crates are super versatile. They are not designed for dogs that tend to chew their crates. Midwest Dog Crates come in a variety of styles and sizes for just about any dog, and any situation, so we have the dog crate that is ideal for you. Midwest produces different models (called “series”) and they are available in a variety of colors, finishes, number and configuration of doors, and more! Why Choose a Midwest Crate? Midwest Metals has been in business since 1921, so you you are buying from a company that stands the test of time. With an emphasis on quality, and with a broad array of crate/kennel options, Midwest has earned the loyalty of generations of pet owners. Whatever your budget and whatever your needs, we likely have a Midwest Dog Crate for you! On this page you can choose by breed, dog size, desired crate size, or by series. Alternatively, just pick the crate that is right for you from the photo list below. Many of our crates feature free shipping. Get your Midwest Dog Crate today! Combine with a playpen and a bed or heated pad! Prices start at just $34.99 - FREE Shipping on $50+ Orders! There are two types of finishes for Midwest wire crates, and one style of fabric crate. Powder Coated: Our toughest finish, available in pewter gray on the Select Dog Crates, in black on the Ultima Pro and in pink and blue on the iCrate Fashion Edition. Electro Coated: Also referred to as “e-coat”, or “epoxy” this black coating provides a beautiful long lasting finish. Fabric: Found on our Canine Camper crates, this finish is both durable and lightweight. All wire Midwest dog crates come with an easy-to-clean pan made from tough, long lasting ABS plastic (exception applies to SKU: 1154U, which has the pan available as an additional cost option). Under normal conditions, these pans will last a lifetime, and provide a flat comfortable floor for your pooch, and easy clean-up for you! Midwest provides the perfect home for every breed and temperament. The crates range from extra-light up to heavy duty, with the wire crates spanning from light up to heavy duty. Extra Light Duty (fabric): crates such as the Canine Camper series, these are ideal for people who travel frequently with a mild-mannered dog, but are not designed for puppies, or “chewers”. Eaxample: Canine Camper Sportable™. Light Duty (wire): new puppies that will be crate trained from the start, breeds with a mild temperament, or if you need the security of a wire crate, but want something lighter-weight for travelling. Examples: iCrate (Single and Double Door) and Ovation. Medium Duty (wire): for older puppies and breeds with an average temperament, providing a great combination of security and crate weight. Example: Life Stages Single & Double Door. Great Selection, Always in Stock! We have a selection of Midwest Dog Crates that is second to none. Our crates are in stock and ready for shipping. You choose the Midwest Dog Crate that is ideal for your dog, and we will ship it to you straight away. We believe in these products and are entirely confident that you will find Midwest Dog Crates well-built, great-looking and that they will provide a lifetime of service.